Are you ashamed of your fat and flabby arms? Even when you do a lot of upper body exercises many of you fail to lose weight from your arms. This is because these exercises tone your muscles but they are not capable of burning the excess fat that accumulates in your arms. There are various ways to remove excess fat from your arms by burning the extra calories. In order to lose weight from your arms, you have to take care of your diet and also do proper exercise regularly. You must drink at least 8 glasses of water daily between your meals. This helps to control your appetite, increase metabolic activities and also burn off the excess fat. But you must take care not to drink too much water with your meals as it interrupts digestion by diluting the stomach acid. You must avoid soda, coffee and other drinks that contain sugar. A proper diet is very important if you decide to lose weight from your arms. The diet you take should be rich in healthy fats, beans, proteins and must consist of slow burning carbohydrates. Some examples are proteins, beans and legumes. These keep you full and therefore you do not overeat. Such food keeps your muscles strong and at the same time burn the excess fat. Your diet must contain more of vegetables and fruits and you should avoid colas, chips, alcohol and other processed food. Saturated fats must be avoided and in their place mono and poly-unsaturated fats should be consumed, which you get from olive oil, flax seeds, walnuts, trout and salmon. Another thing to keep in mind is that you should consume whole grains and avoid flour and refined sugar. Instead of taking larger meals two or three times a day, it is better to have smaller meals four to five times a day. This does not make you hungry and prevent you from overeating. After a workout, your muscles get tired and need nutrients. So have a liquid meal like protein shake after the workout, as liquid food is easily digestible than solid food. Also remember that you must have meals at least 90 minutes before you do your exercise. You can lose fat from your body only if you reduce the calorie intake and at the same time burn more calorie than you take in. This is possible by cutting down your calorie intake to 500 calories daily. You also have to do exercise and burn calories. The calorie intake should be cut down gradually and not all of a sudden, because if you cut it all of a sudden, it may cause you fatigue and dizziness. You must take a healthy and balanced breakfast every day, consisting of food rich in fiber and lean protein. A healthy and substantial breakfast keeps away hunger for the whole day and makes you energetic. Stand upright with your arms spread to the sides straightly and then twist them s that your palms face the ceiling. Twist the arms horizontally so that your arms again face the ceiling. Cardiovascular exercises like walking, swimming, running, aerobics etc can easily burn the calories. Chair dips id good for the back of your arms, the triceps. For this put your body in front of the chair and lift the chair after you lower your back on the floor. This is repeated 8 or 9 times. This is another effective way to remove fat from your arms and make them lean and strong. Get into planking position and then move your arms up one by one along with your body. This exercise resembles a scissors that is opened and closed. This is one of the fastest ways to lose weight from your arms. Stand straight and then stretch your arms in front of you at the level of your shoulders. Now stretch them to the side and bring both the arms to the front again, letting your right arm overlap the left one. Now repeat it, and this time let the left arm overlap your right arm. This is done to tone the back of your arms. For this take a dumbbell and keep it in your right hand. Move it towards the ceiling after placing your left knee on a bench. This is then done with the left hand and the right knee. Your back must be straight when you do this exercise. Lifting weights helps to shed fat from your arms. 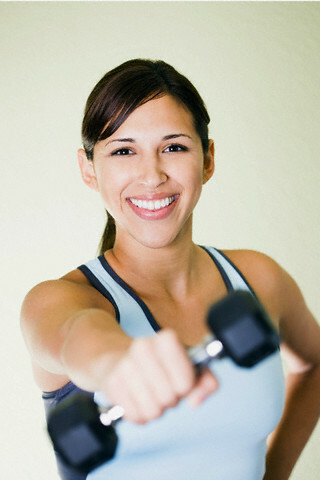 Start by lifting 2 to 3 pounds and then you can exercise with heavier weights. This way the muscles of your arms become stronger and leaner. To do this exercise, hold the weight in both of your hands, bend your arms and the elbows and lower it to the ground. Then rise up from the ground and extend your arms. Yoga is one of the excellent ways to lose weight from your arms. So practice yoga at least 2 days a week. This makes you muscles strong and stretches your muscles. your arms with bulky muscles is replaced by long streamlined arms by doing yoga. So you can see that if you follow the proper diet and do the exercise regularly, you can easily remove weight and excess fat from your arms and have lean and strong arms instead.